After a record amount of tax-deductible donations during Singapore's Golden Jubilee in 2015, the feel-good sentiment waned and the amount received last year fell sharply by 36 per cent, from $1.361 billion to $865.6 million. It is the lowest since 2011 and the situation may not improve this year, charities say. "The economic uncertainty may have had an adverse effect on charitable giving," said the Office of the Commissioner of Charities (COC). Its annual report released on Thursday showed tax-deductible donations by companies fell by nearly half last year. Donations by individuals dipped by 10.4 per cent. The Office of the COC also attributed the sharp fall in donations to the tax deduction of 300 per cent reverting to 250 per cent after 2015. The tax incentive was enhanced that year to encourage charitable giving in celebration of Singapore's 50th birthday. It meant for every dollar donated, $3 - instead of $2.50 - was deducted from the donor's taxable income. Only charities that are institutions of public character can collect tax-exempt donations. 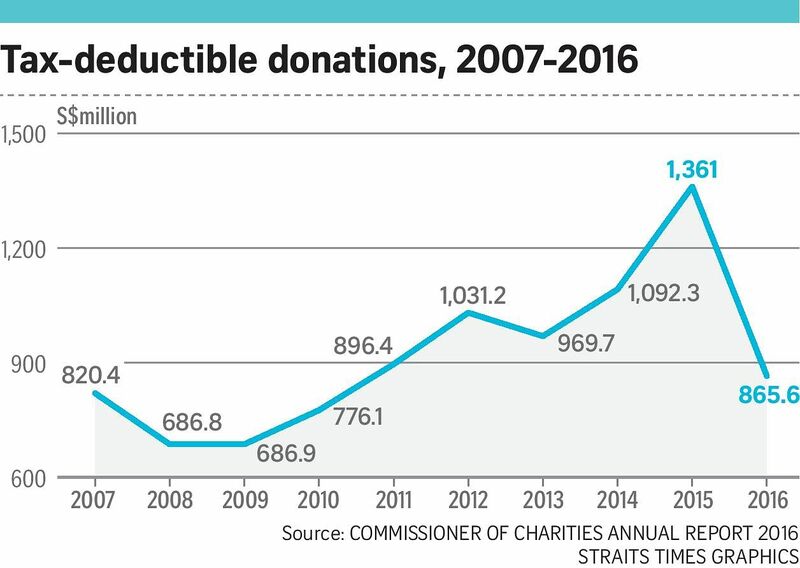 Social service veteran Gerard Ee, chairman of the Charity Council, which advises the COC, told The Straits Times: "A 36 per cent drop in tax-deductible donations is a lot, but it is not that surprising, since 2015 was also an unusual year." The amount had jumped by 24.6 per cent from 2014 to 2015. Apart from the enhanced tax incentive and the feel-good mood during SG50, there was also Care and Share, a government grant that matched donations from December 2013 to March last year. Charity experts said they were not confident that the drop in tax-deductible donations last year would reverse this year. Mr Ee said: "I'd be very happy if the figure just stabilises. Businesses have been seeing less profits, so they may be less inclined to give." Club Rainbow, which helps chronically ill children and their families, received some $2.5 million in tax-deductible donations last year, 9 per cent less than in 2015. I'd be very happy if the figure just stabilises. Businesses have been seeing less profits, so they may be less inclined to give. MR GERARD EE, chairman of the Charity Council, on expectations for this year. Its executive director, Mr Jerome Yuen, said: "We expect the amount to be even lower this year, so there are efforts to manage costs and review our upcoming fund-raising efforts to drive better results." To cope with the dip in donations this year, the charity has adjusted its operations to use funds more efficiently and reduce costs. It also used online platforms such as Giving.sg to help in its fund-raising. Meanwhile, Dr Ang Hak Seng, who was appointed the COC in January, told Chinese daily Lianhe Zaobao on Thursday that his office will work with crowdfunding websites to establish an industry-led code of practice, and this could be ready as early as next year. For instance, information about the beneficiaries of donations should be verified, and information on how the funds are used would have to be published. He also said in the report released by his office that he wanted to move towards "co-regulation". This could be done with crowdfunding websites too. "While my office (is) the regulator of the (charity) sector, we encourage active support from all stakeholders in our efforts towards promoting good governance and enhancing regulatory compliance."